A little over a year ago, I spoke with Stuart from Liberty Mutual out of Charlotte, NC. Stuart asked me how he could increase his chances of getting selected for corporate health fairs in his service area. At the time, Stuart wasn’t having much luck on getting into health fairs through Health Fair Connections' (HFC) platform. I shared with Stuart the 5 main tips to increase his chances of being selected to attend health fairs. 1. Have a good booth photo on your profile and listing (health fair hosts want to see what you’re going to look like at their fair and they like to see things like branded tablecloths). 2. Have an over-the-top raffle prize, like college basketball or football tickets. 3. Have an interactive offering, like offering the drunk driving experience with the remote control car. 4. Have a strong message for the host (you add this when joining the interested vendor list). You’ll want to explain to hosts why you’re a good health fair vendor (start with a raffle, then offering, then service, and work in things like you standing and being engaging). Since our phone call, Stuart has participated in 8 health fairs via HFC. I would like to add another takeaway and reference tips 2 and 3 above. 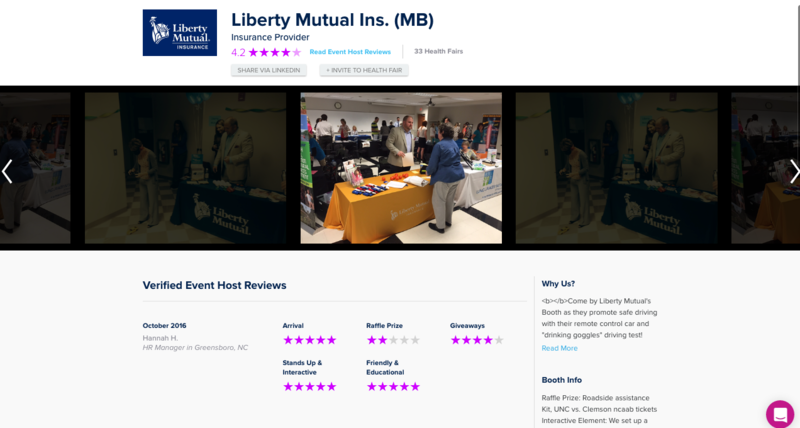 It’s important to note that Stuart and other Liberty Mutual Reps like Stuart are attempting to get into health fairs - keyword: health. While true, many corporate health fairs do have a prominent benefits aspect (i.e. insurance, 401k), most health fair hosts want to keep their fairs as health and wellness oriented as possible. For folks in categories like workplace banking, continuing education, financial planning, life insurance, and like categories -- they need to go above and beyond to secure booths in these fairs. The raffle prize and interactive offerings are the two factors that can be deal breakers and cause the host to make exceptions to let exhibitors folks in like Liberty Mutual. Both have done exceptionally well in getting accepted into health fairs. Over 90% of the time, these guys go with the high chance option when joining interested vendor lists for health fairs. Hope this is blog post is helpful to you guys. Best of luck getting into health fairs and hope you have much success.